The cold that hits the face every morning in a New York February can be distracting, if not painful. I touch my nose, red from the freezing wind, as I walk up the stairs of a Brooklyn duplex, where I meet a full rack of shoes at the door. I know the drill. Entering a home sans footwear is a given and second-nature in African homes; not only does it keep in line with the cleanliness of the space, but it's also a way to ensure the protection of the energy in the home. I take off my coat and slide off my shoes as custom. As I undo a bundled scarf, Soull Ogun greets me with a warm "how are you?" Taking in a deep breath of cleansed air, I reply. "I'm fine." I'd like to think my brevity is due to my thawing, but still stiff body. Later, I realize it's due to the nerves of finally sitting down with the coolest twins in Brooklyn, or rather the world. The latter statement isn't hyperbole. One look at Dynasty and Soull Ogun's online footprint reveals that their coolness is unmatched. An originality that can't be duplicated, the two effortlessly pull off looks from their fashion house L'Enchanteur in a way that makes you wish you too were dripping in textured, androgynous trousers, velvet durags and thick gold bracelets. And it isn't for promotion—what you see on curated Instagram timelines is what you get in person. The two are through-and-through their authentic selves. We're just along on their journey. Soull offers me filtered water before giving me the go ahead to mill around while I wait. Stepping into their world, I come across the fixings of a lived-in, renovated apartment. To my left there are spacious black marble countertops, stainless steel appliances with magnets holding up knick-knacks and photos on the fridge, opulent dishware and goblets made of swanky green glass; outerwear hung on hooks. To my right the sun shining east greets me, yielding natural light that glistens, reflecting off of the unique jewelry, textiles, and accessories that culminate the Nigerian-Dominican twins' jewelry and fashion brand. An anthropological portal that simultaneously serves as their seating area, an array of handworked gold and silver adornments, meticulously manipulated crystals and precious stones surround me. L'Enchanteur is an invitation from the Oguns to "transform your lifestyle." With artisan craftsmanship at its center, their incubator of original jewels, objects, eyewear, clothing and more is the physical manifestation of true empowerment through energy connection. L'Enchanteur meaning "the enchanting" in French is truly fitting to the mission of the brand. Receiving their energy through their pieces ensures that the energy never dies—rather, it transfers. As the world continues to transform, their work is a spiritual discourse to that constant change. Their pieces are so unique, but it's likely that you've come across them before. 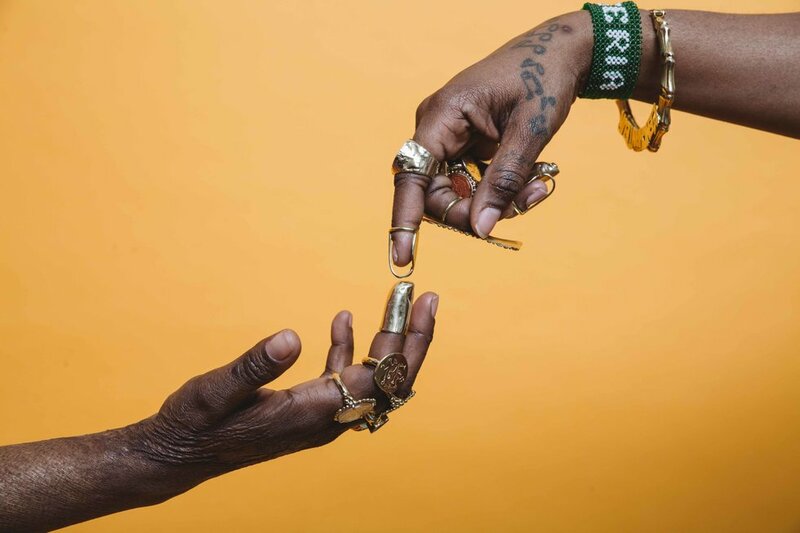 Their signature gold nail rings, necklaces and more have adorned the likes of J. Cole, Erykah Badu, Ciara and other artists who use their iterations of work as transformation moments. These jewels that stand out to many are a simple homage from the regal, elegant past, to even the height of the bamboo earring era of streetwear accessories. Soull, who helms the metalwork side of the brand, takes the liberty to be fluid and experiment with her creations of medallions, earrings and necklaces, some that are casts of the parts and imprints of the body that make a woman, but dripped in gold. Dynasty takes textured fabrics, needle and thread to create timeless pieces of a wardrobe that are meant to last a lifetime. Who else wouldn't want a brimless velvet cap, a customized fez or even a luxurious durag one can pass down from generation to generation? The neurotic tendency to check the time fades when having a conversation and just being with the Ogun twins. Not to mention, they're at-home fly is unmatched. Effortless. Soull, who sits to my left on a blood-red, leather armchair, dons a black, velvet brimless cap tying in leisurewear with motocross chic. 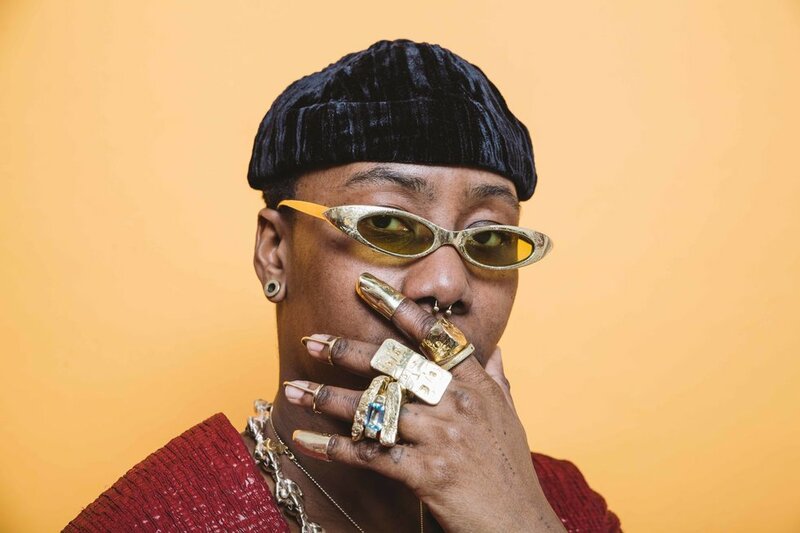 Dynasty lounges to my right, rocks a black durag—matching her twin with the black headwear—with tailored, neutral-colored pieces that seem comfortable enough to roam around inside, yet turn necks outside. The Oguns epitomize twin energy and ibeji in every way; Soull is Kehinde and Dynasty is Taiwo. It's a comforting fascination how our ancestors and culture have been able to make sense of such a folkloric dynamic that's omnipresent. They reflect each other; they finish each other's sentences; they're attached at the rib. "It's a pretty unique coming together, essentially. We were born in Flatbush, Brooklyn. So that adds this other layer into the concept of [originality]. Because of that, there's an immediate inspiration and influence that allows us to kind of create this original thing," Soull ruminates. They light up when I pose the question of how they developed the art of storytelling in their formative years—creative writing is one of the first iterations of art they were interested in. They even made it a side hustle in high school. "I've always been able to create a certain type of world where stories could be told, people's voices heard and something you'll aspire to be," Dynasty says. "With mythology there are these different—what do you call them? Not characters, but—"
"Oh, I was just thinking about this the other day," Soull interjects. "They're called—"
"Archetypes?" Dynasty asks her sister. "All these different archetypes that we are, all the stories and mythologies that we actually hear are personifications of things that are going on within our inner selves," Dynasty concludes. Their perspectives and, in turn, what they produce informs one another. "I think part of our practice is because we intertwine it into our everyday life. Every day we're ibeji," Soull continues. "Every day, we think collectively and then also the separate collective aspect of it. We see through the separateness, the different sides of it, and then bring it together to create this newer version of it—or this new perspective, so to speak, by merging the double perspective happening simultaneously, as twins." They also opted to shorten their last name from Ogunmoyin to Ogun—to channel the Yoruba god of iron; the warrior and orisha of metalwork. Each stitch, each hammer to the metal is a service. "The idea of the service to humanity is Ogun, especially in the type of work that we're doing," Soull says pensively. "Whether, it's inspired through mythology and mysticism, spirituality based on the Yoruba pantheon—we walk with them all the time in what we do. They're always present in the work. I think you see that interweaving of this past, and then this future, and then it happening in the present. The work is the product of who we are." Dynasty notes this dynamic has been this way since they were young. They say their father still jokes around calling Soull Dynasty's "bodyguard," and they've come to understand that he's acknowledging how they relive the birth of ibeji through their work. Dynasty scopes what their world looks like; Soull follows with the knowledge to translate that into a tale through the metalwork. 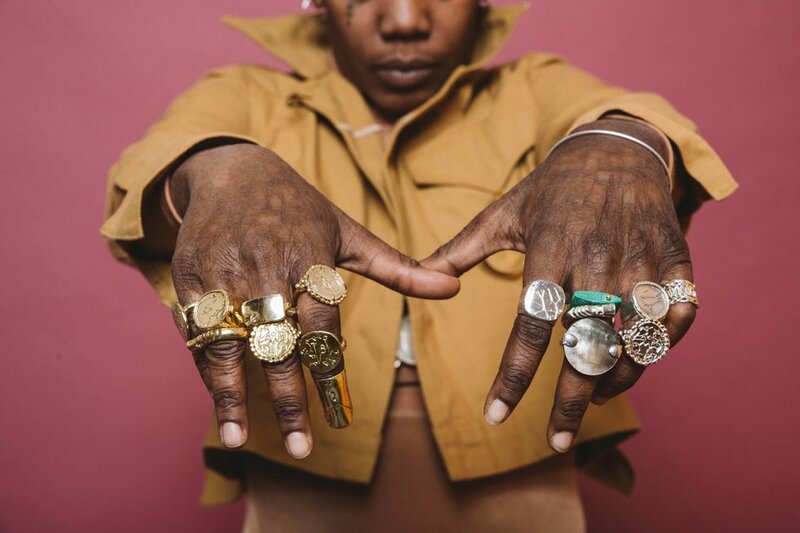 "When Soull is showing that type of metalsmithism—that's a new word I just created—there's a sense of nostalgia with it," Dynasty shares with me, using her hands to emphasize her thoughts. "You're feeling like you're in some type of time loop, where you can gather information from a past world—which is through our bloodline and our blood system—and how we interact with each other. Then there's the thought, 'This is what the world is gearing towards.' This original type of thinking is how we bounce off each other within our work—we're putting the pieces together." Soull and Dynasty's first fashion icons were their mother—a seasoned seamstress who comes from a family of carnival costume-makers—as well as their father, who would don crisp suits and traditional agbada with confidence. During their formative years in school, what they thought was their mother was giving the "in-crowd" ammo to make fun of them was really her giving them the keys to true individuality. Wearing creme-colored Air Force Ones instead of the white ones and cinnamon-colored Timbalands instead of the classic constructs paired with custom clothes she sewed for them set the Oguns apart to be subconscious trendsetters. Coming into their own as ibeji, as Nigerian-Dominicans living in America can even be footprint for first-gens coming behind them to be inspired by. As Dynasty notes (and as Kwame Nkrumah proclaimed), being African is not only putting a pin on a location, it's also a global scale of being, of thinking; of doing. It's within. "We've experienced a unique upbringing as American-born citizens," Dynasty says. "We can really bridge the gap between the so-called African-American and the so-called African because we are actually that being—we're actually both. We have to think of it as a bigger mind than just where we're from. I feel like I'm home anywhere I'm at because of how our parents brought this sense of home with them to the States. Although we weren't in both places, they brought our minds there." Just as the word "present" means "gift," that's where Dynasty and Soull remain in the pocket of their spiritual practice—reveling in today. "The past is something that you can try to hold onto—it gives you anxiety or regret. The same thing with the future," Dynasty says. "I think the full picture is seeing that the glass is always full, because it's always filled with water and filled with air. There's nothing less; there's nothing more. It is what it is. If you can see it as that, then you'll be able to really think in the present moment and see things as they truly are. We can make our reality what we want it to be. It creates dimensions and creates different types of worlds." When looking at something for what it truly is, Dynasty says, "you can stand squarely in front of it and know what the truth is. Then the truth can—"
"Set you free," Soull fills in. Heady from the magic in the room, I gather my things to leave. The goodbye dance begins as our farewells turn into random banter. Hugs indicate that I'm really leaving, with Soull inserting one more question as I walk down the stairs of their Brooklyn duplex: "What's your sign?" "I'm a Gemini," I reply. "Ah, that makes sense now," she says as she closes the door with one last goodbye. Just shooting the breeze and getting to know the Oguns as people encompass their brand—I know it wasn't necessary to have them state the obvious. I found after sitting in the midst of their quick-witted, introspective trains of thought that it's a direct reflection and manifestation of themselves. I walk back out into the cold with a renewed sense of my own ever-evolving triple consciousness—Soull and Dynasty exemplify that it's truly possible to look to the past to inform how we navigate the present day, and build a future that's true to our various selves.